Phonemes are perceptually distinct speech sounds that distinguish one word from another, e.g. the “p”, “b”, “t” and “d” in “pie”, “by”, “tie” and “die”. They’re also articulatory gestures. A 2009 article co-authored by reading guru Linnea Ehri says “awareness of articulatory gestures facilitates the activation of graphophonemic connections that helps children identify written words and secure them in memory.” Melbourne Speech Pathologist Helen Botham (Hi, Helen! ), lists a number of references on her Cued Articulation website indicating articulatory awareness facilitates phonemic awareness. I sit right across the table from my clients, so we can see and hear each other’s articulation well. It must be a lot harder to teach a whole class about phonemes, in order to link them to graphemes. 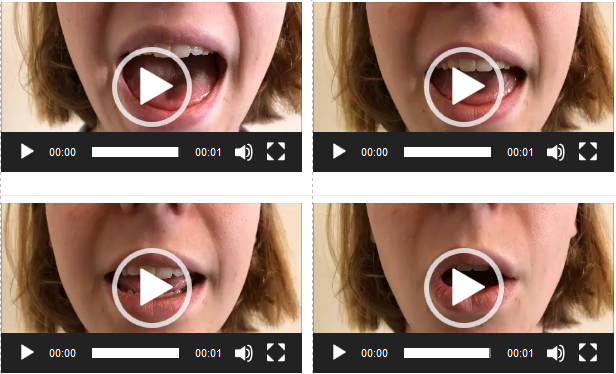 Videos on the internet (including my own) about phonemes seem to put them all in one video, making them hard to isolate and repeat on a classroom interactive whiteboard. I’ve thus filmed my utterly adorable and orthodontically photogenic niece Vivien (thanks, Vivien!) saying each phoneme separately. The 44 videos are below, each with example words which link to the relevant spelling lists on my website. I hope these are useful in developing kids’ phonemic and articulatory awareness, as well as in teaching adults to say consonant sounds crisply and correctly (without adding a schwa vowel or voicing voiceless consonants) when teaching blending, segmenting and more advanced phonemic awareness. Finally, I should say (for the linguistic purists) that there is more than one way to slice and count sounds, and how you do this is also affected by your accent. However, slicing and counting them this way (24 consonants, 20 vowels) seems to me to make the most sense of our complicated spelling system for speakers of General Australian English. The Speech Pathology purists will also notice that Vivien’s alveolar fricatives are slightly fronted (i.e. she has a very tiny lisp) but it’s not noticeable to most people, so I think the /s/ and /z/ recordings I’ve made still count as allophones of /s/ and /z/. People who don’t like them can get their own niece, or someone else, to face the camera. In fact, teachers might find that kids enjoy making videos of each other pronouncing the phonemes, and find doing it and watching the results helps get everyone thinking and learning about speech sounds. Why use my videos when you can make your own?! This entry was posted in consonants, phonics activities, sound-letter links, sounds, teaching strategies, vowels on May 20, 2018 by alison. What an amazing resource! Many thanks to you and Vivien for creating and sharing it. Thank you, I can see so many practical applications for this resource. Many thanks to your neice, also. Really amazing resource. Thank you! Thank you Alison and Vivien! These video clips have helped one of my little student’s today. The little girl must have noticed Vivien’s beautiful teeth because she said that perhaps the gap between her two middle teeth made it harder for her to say the ‘l’ sound. It really helped the little girl to change the shape of her mouth and produce a better sound.